Gator Bites, Issue #038 - Happy Holidays! The weather sounds absolutely frightful up north ..... stay warm and stay safe up there! We are in the low to mid 80's and still in tank tops, shorts, and flip flops. Sorry, don't mean to rub it in! This past month I decided to move my Southwest Florida blog pages over to Come-to-Cape-Coral.com to make things easier for me. I'll be graduating my youngest daughter from our homeschool by next month and am looking for a job, after 20 years of homeschooling. But don't worry .... I'll still be sending out Gator Bites, and adding to and working on Come-to-Cape-Coral ..... it's my passion! 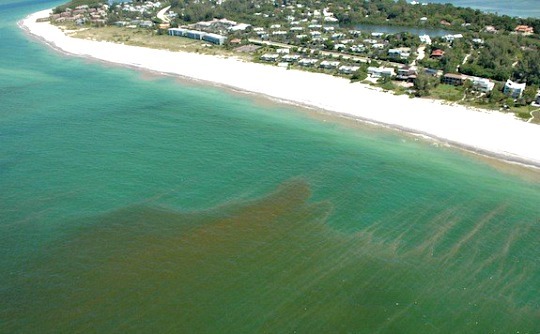 Meanwhile, I built pages about Red Tides - which we are actually having right now at beaches further south in Bonita Springs - Westin Cape Coral, and New Years Eve. Red Tides are a condition at the beach that is quite the nuisance because they kill fish and can cause respiratory illnesses in humans. Go to my Red Tides to find out what causes them and for more information. Westin Hotels bought The Resort at Marina Village and it is still as luxurious as it was before and one of my most favorite spots in the Cape For dining, nightlife, shopping, and boating. 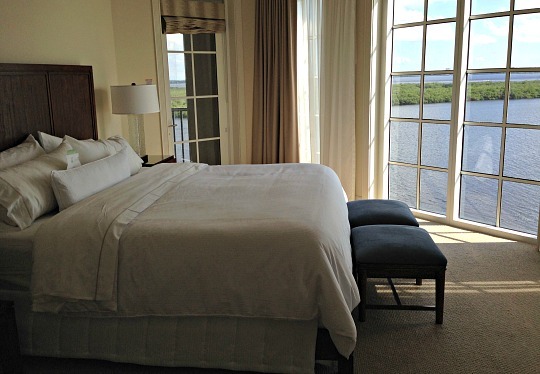 Go to my Westin Cape Coral to see photos and videos of our fabulous resort! 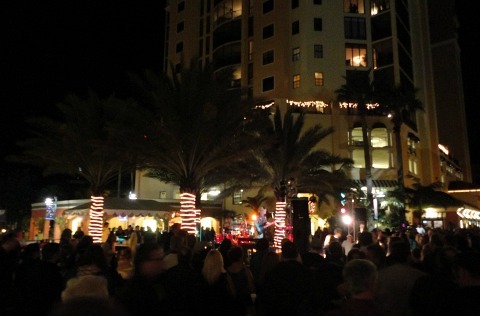 There are two fabulous New Years Eve parties in Cape Coral, one at Cape Harbour, the other at the Westin Cape Coral. Dance the night away, watch the ball drop, enjoy live music and fireworks ... all on the water on a warm evening spent outside! Tree Lighting Ceremony is tonight, Saturday December 7th. Christmas Boat Parade is next weekend on Sunday. Captiva Holiday Village is going on the next two weekends with arias on the beach, parades, luminaria walks, and carol sings. Edison Ford Winter Estates - this is a great time of year to go see where Thomas Edison and Henry Ford vacationed each winter in Fort Myers. 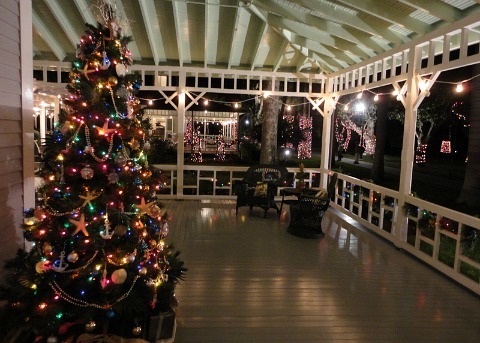 The homes and grounds are all decorated for Christmas and it is just beautiful! Eden Vineyards - Still looking for Christmas gifts? Why not give one of the delicious wines from this southernmost winery in the USA in Alva, east of Fort Myers. River Boat Cruises - Get in the holiday spirit by going dining and dancing on a boat cruise down the Caloosahatchee River! Wisteria Tea Room - Flavorful teas, tasty sandwiches, and delectable treats await you at this Fort Myers tea room. They also have a lovely gift shop for great holiday shopping ideas! Buckingham Blues Bar - This is the place to go for blues lovers, their monthly Backyard Bluesfest is a lot of fun and a fun way to spend a Saturday afternoon. Sand Sculpture Contest - Held in Ft Myers Beach the last week of November, this festival is fun for the whole family .... plus there are some amazing sand sculptures! Solomons Castle - Howard Solomon built a tin castle for his home, created a bunch of quirky art to put in it, and now gives tours of his wacky museum. And that's not all, he built a boat in an actual moat ... which is now a restaurant! Salvador Dali Musem - Art Lovers will think it worth the drive to St Petersburg to see this fantastic museum. Zombicon - Last but not least is one of the largest zombie festivals in the world. It's held in downtown Fort Myers before Halloween. 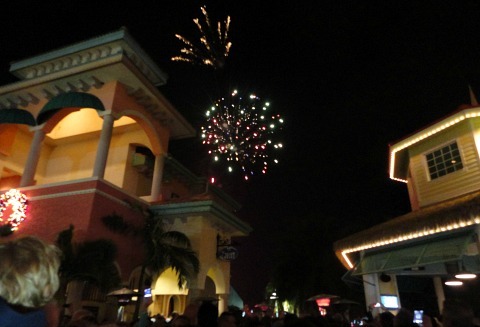 Fireworks at the New Years Eve party at Cape Harbour! Don't forget, my next newsletter comes out the beginning of February so I can take time off for the holidays! George Patton and Associates - Real Estate - George is the best! He found me my place, which I absolutely love. Several of my Come-to-Cape-Coral readers have used him as well, and he has been able to find them homes too. Venture Out - Fishing - The Cape Coral area has some of the best fishing in the world and Venture Out offers all kinds of fishing charters. Contact them, everything is taken care of for you, all you have to do is set the date and show up! Creative Coast Weekends the second Friday during season. Live music and Ladies Night at Longboards at The Joint on Tuesdays and half-price pizzas on Wednesday.